Harlan Coben's beach-read bestseller "Tell No One" becomes a crackerjack thriller -- made in France. 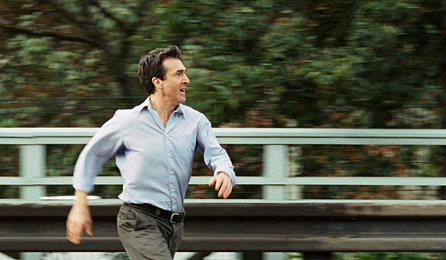 François Cluzet in "Tell No One." Adapted from a novel by best-selling American mystery writer Harlan Coben, Guillaume Canet's hit French thriller "Tell No One" has a certain mid-Atlantic hardness about it, an undercurrent of profound psychological or spiritual disturbance that doesn't quite seem French but isn't exactly American either. Canet, a 35-year-old acting-writing-directing phenom, has transposed the book's upscale and downscale New York locations to Paris and environs, packed the cast with top-notch Gallic acting talent, and made a film that clicks along efficiently from one hair-raising discovery to the next (although at two hours-plus, it's both longer and denser than most Hollywood genre pictures these days). Like most effective but not transcendent thrillers, the Frenchified "Tell No One" ("Ne le dis à personne," across the pond) uses its characters and setting as the scrim that barely conceals a deeply paranoid view of the universe, perceived as a zone of systematic Darwinian cruelty. (I'm not disputing that this may be correct, only raising the idea that there are various ways to present it.) That universe seems to be collapsing on top of Paris pediatrician Alex Beck (François Cluzet) at two different points in the space-time continuum. A gruesome discovery has led the cops to reinvestigate the mysterious murder of Alex's wife and childhood sweetheart Margot (Marie-Josée Croze, of "The Diving Bell and the Butterfly"), which happened eight years earlier at their lake house. Meanwhile, Alex is receiving unexplained emails, one of them containing a video that suggests, incredibly, that Margot is still alive. But then whose corpse was identified by Margot's upstanding cop father (André Dussollier) at the crime scene? And who are the terrifying freelance goons who travel around town kidnapping, torturing and interrogating people -- and framing Alex for their crimes? As the emails that may or may not be from Margot instruct Alex, he can tell no one and trust no one. As it is, he's a damaged loner whose only friends are his equestrian sister's lesbian lover (Kristin Scott Thomas) and a gun-slinging drug dealer named Bruno (Gilles Lellouche) whose hemophiliac son he has treated. Whether or not those two remain trustworthy, the police brass have become convinced that Alex is a psycho serial killer, while suave, horsey billionaire Gilbert Neuville (Jean Rochefort) has his own reasons for suspecting that Margot isn't dead. (Canet himself plays a small but crucial role as Neuville's son.) Only the rumpled, plodding police detective (François Berléand) and the hardass, multitasking defense lawyer (Nathalie Baye) gradually begin to perceive the pattern linking all these things together. Maybe I just see too many plotless indie films where plausibility isn't an issue, or maybe this story demands an enormous leap into the improbable, but I was engrossed by "Tell No One" from end to end without believing a moment of it. OK, Alex is depressed and psychologically shattered, I buy that. But I don't buy that this erudite and fully functional young doctor has apparently been near the center of an enormous criminal conspiracy -- or a couple of different but interlocking ones -- for years, without noticing that anything was wrong. There are further plot problems I can't discuss without giving too much away. Let's just say that the story of what happened to Margot and why would be more believable 50 years ago, when information was not globally and immediately accessible, than it is today. Crisply and competently filmed, "Tell No One" is an intriguing sample of new-school French cinema at the more commercial end of the spectrum. It's a demanding film in terms of its intensity, mechanical complexity and underlying fatalism, but without remotely being intellectual. Genre-film buffs and Hollywood insiders will study it avidly, and it could do decent late-summer, art-house business. When the inevitable English-language version follows, it will provoke a trivia question (and one I can't answer, at least not without more Internet spelunking than I'm willing to do right now): Name other American movies inspired by foreign-language films based on American novels. "Tell No One" opens July 2 at the Angelika Film Center and City Cinemas in New York, with national release to follow.